Malwarebytes found two and removed them, but nothing will run because I get this error. Small Business Server 2003 with service pack 2. Computer Name: SERVER1 | User Name: Administrator | Logged in as Administrator. Hello Bhzendner, Welcome to Malware Removal section of the forum. I need some time to revise your logs... In the meantime can you please post the Extras.txt log OTL created on the C:\Documents and Settings\Administrator\My Documents\Downloads? Also I would like you to run Malwarebytes click the Logs tab select the most recent one from the list and click the Open button. Notepad will open with the log please copy & paste it contents to your next post. One question can you tell me exactly which programs complain about MSIMG32.dll is missing? I am very lucky, two for the price of one. unknown, version 0.0.0.0, fault address 0x00000000. more information, click Backup in Server Management, and view the log files. Description = The DNS server has encountered a critical error from the Active Directory. (which may be empty) is "". The event data contains the error. from Active Directory for this zone and is unable to load the zone without it. the Active Directory is functioning properly and repeat enumeration of the zone. /? ", "del /? ", "rmdir /? ", and "dir /?". with DCOM within the required timeout. after fixing the problem by running 'wlbs reload' followed by 'wlbs start'. When I try and Open Internet Explorer or when I try and open SuperAntiSpyware. Do you have another log on Malwarebytes that show what was detected before? C:\WINDOWS\i386\MSADOMD.DL_ (Trojan.FavLock) -> Quarantined and deleted successfully. C:\WINDOWS\$NtServicePackUninstall$\msadomd.dll (Trojan.FavLock) -> Quarantined and deleted successfully. The files detected by Malwarebytes as Trojan's aren't infected its a False Positive you can confirm here. Double click the OTL icon from your Desktop. Make sure all other windows are closed and let it run uninterrupted. Click the button. Do not change any other settings unless otherwise told to do so. Then click the Run Scan button at the top. The scan wont take long. When the scan completes, it will open notepad with OTL.Txt. The file is saved in the same location as OTL. 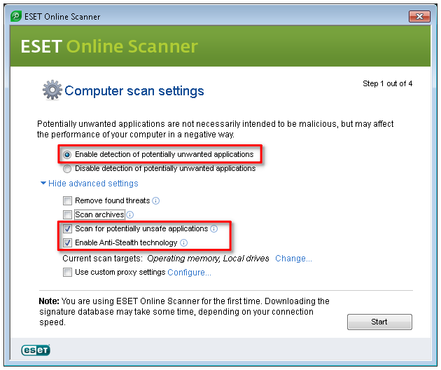 Download Eset On-line Scanner, run the tool and follow the prompts to install the program. Make sure the options Remove found threats and Scan Archives are Not ticked. Click Start and then wait for the scan to finish (it will take some time). The virus signature database will begin to download and the Scan will start automatically. Be patient this make take some time depending on the speed of your Internet Connection. Right click on the icon and choose Run as Administrator. Follow the onscreen instructions inside of the black box. Did the quarantined files restored ok? sh=851F55135FD4A5A3A631058F3CEAF43F4C12242B ft=1 fh=7865fbaf7b732973 vn="a variant of Win32/Bundled.Toolbar.Ask application" ac=I fn="C:\Documents and Settings\Administrator\My Documents\clamwin-0.97.8-setup.exe"
The ESET scan didn't like the clamwin setup file you have on the My Documents folder, make sure you download the install programs from the Official sites www.clamwin.com in this case, I just tested and the file clamwin-0.97.8-setup.exe from this site is clean! Double click the OTL icon from your Desktop. Make sure all other windows are closed. click the Run Fix button at the top. Let the program run uninterrupted. The Security Check report shows that you need to Defrag your C: drive if you don't have an SSD disk!. You have Defraggler installed it's a good Disk Defrag but I personally recommend MyDefrag it's free and really defrag system locked files like the PageFile, registry files, etc... that other programs do not touch. After the reboot, is everything running OK now? C:\Documents and Settings\Administrator\My Documents\clamwin-0.97.8-setup.exe moved successfully. When I tryed to download and run your defrag probram it downloaded, when run it gave me Unable to Locate Component - This application has failed to start because misimg32.dll was not found. Re-installing the application may fix this problem. When I tryed to run IE I got Error Loading C:\Windows\System32\inetcpl.cpl. The specified module could not be found. It run and asked for a reboot, when I rebooted it came back up to a Dell screen, not icons, not task bar, just background. I can run the task manager by pressing CTRL+ALT+DEL. From the Task Manager can you start Explorer? I would like you to test the disk for errors. Let me know if after Check Disk the system loads normally or not. explorer.exe says it is running but I still have a blank screen? chkdsk says it will have to run on next boot. Ok, Please reboot and let chkdsk run the scan. Looks normal when booting now, thanks. starting at 0x59ba for possibly 0x1 clusters. in file 0xbf6e is already in use. from file record segment 49006.
with parent 0x68de is not the same as 0x158b000000000327. Deleting index entry avh_avmisc in index $I30 of file 26846.
with parent 0x68de is not the same as 0x2bad0000000000a6. Deleting index entry avh_avpe in index $I30 of file 26846. Deleting index entry AVH_AV~1 in index $I30 of file 26846.
with parent 0x68de is not the same as 0x1592000000000384. Deleting index entry avh_BLENG in index $I30 of file 26846. Deleting index entry AVH_BL~1 in index $I30 of file 26846.
with parent 0x68de is not the same as 0xb7480000000000a9. Deleting index entry avh_libradb in index $I30 of file 26846. Deleting index entry AVH_LI~1 in index $I30 of file 26846.
with parent 0x68de is not the same as 0x52e20000000002a0. Deleting index entry avh_oriondb in index $I30 of file 26846. Deleting index entry AVH_OR~1 in index $I30 of file 26846.
with parent 0x68de is not the same as 0xcd4d00000000032d. Deleting index entry avh_SWCDB in index $I30 of file 26846. Deleting index entry AVH_SW~1 in index $I30 of file 26846. Recovering orphaned file avh_avpe (166) into directory file 26846. Recovering orphaned file AVH_LI~1 (169) into directory file 26846. Recovering orphaned file avh_libradb (169) into directory file 26846. Recovering orphaned file AVH_OR~1 (672) into directory file 26846. Recovering orphaned file avh_oriondb (672) into directory file 26846. Recovering orphaned file AVH_AV~1 (807) into directory file 26846. Recovering orphaned file avh_avmisc (807) into directory file 26846. Recovering orphaned file AVH_SW~1 (813) into directory file 26846. Recovering orphaned file avh_SWCDB (813) into directory file 26846. Recovering orphaned file AVH_BL~1 (900) into directory file 26846. Recovering orphaned file avh_BLENG (900) into directory file 26846. Cleaning up 427 unused index entries from index $SII of file 0x9. Cleaning up 427 unused index entries from index $SDH of file 0x9. Cleaning up 427 unused security descriptors. Inserting data attribute into file 49006. 20972857 KB total disk space. 20333980 KB in 45776 files. 13208 KB in 3225 indexes. 621793 KB in use by the system. 43536 KB occupied by the log file. 3876 KB available on disk. 5243214 total allocation units on disk. 969 allocation units available on disk.